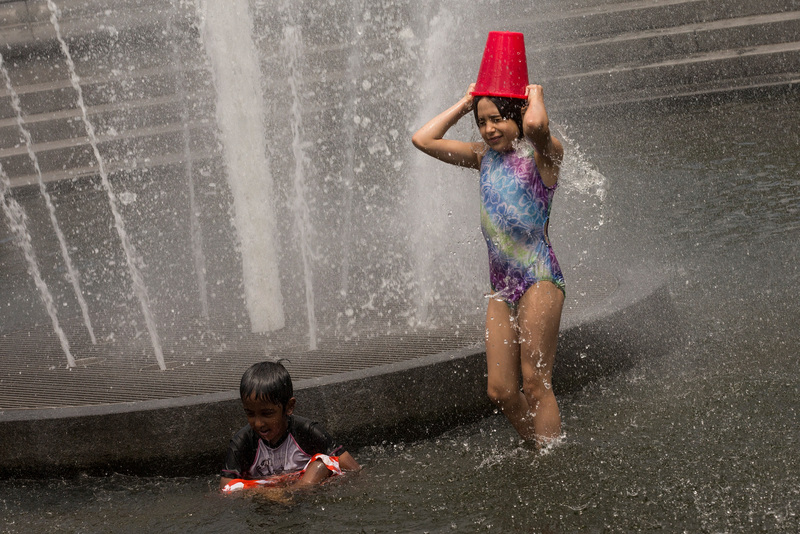 A heat wave gripped much of the East Coast Monday and forecasters said the scorching temperatures are expected to last through the week. A heat advisory is in effect for New York City until midnight Tuesday as temperatures across the Tri-State area are expected to soar into the 90s through the weekend, CBS New York reported. The Boston area is also bracing for the longest, hottest stretch of the summer so far as many towns will top 90 degrees for 7 straight days, WBZ-TV meteorologist Terry Eliasen reports. There will be no real relief from the heat or humidity other than at the immediate coastline where some localized sea breezes will help ease the pain. In New Jersey, an excessive heat warning is in effect for Mercer, Gloucester, Camden and northwest Burlington counties. A heat advisory is posted for the rest of the state. On Monday, it hit 95 degrees in Washington, D.C., as well as Philadelphia. It reached 93 degrees in Caribou, Maine, way up in the northeast of the country. The National Weather Service has also issued a heat advisory until 8 p.m. for Nassau County, the lower Hudson Valley and parts of Connecticut. CBS News meteorologist David Bernard said the extensive hot weather is due to a jet stream riding way to the north of the country, creating a large bubble of hot air over the Mid-Atlantic region, the Midwest and the Northeast. Heat advisories are issued only when the combination of heat and humidity is expected to make it feel like it's at least 95 degrees for two consecutive days or if the heat index values reach 100 to 104 degrees for any length of time. This week, there will be both. "It's going to be very hot and humid this week. The weather can be dangerous, especially for those without air conditioning, the elderly and those with chronic health conditions," said Mayor Michael Bloomberg. "There are about 425 cooling centers that we have open around the city for those needing relief from the heat." New York City's Office of Emergency Management advises seniors and people with health conditions to stay in air-conditioned areas. It says all New Yorkers should avoid strenuous activity and drink plenty of water. Dr. Kevin Baumlin, vice chair of the Department of Emergency Medicine at Mount Sinai, says it's important to heed warnings if you want to stay healthy. "Your body temperature can rise and when your body temp starts to rise higher than your ability to get rid of heat, perspire or cool down, your body can get into significant trouble," he said. "The most significant symptoms are dizziness, weakness and what we call altered mental status." Anyone overcome by heat should call 911. The OEM says city cooling centers at senior centers, libraries and community centers will be open through Thursday. Nassau County says it's extending the hours at its major outdoor swimming pools because of the "extremely high temperatures and humidity." Pools at five locations will remain open until 8 p.m. on Monday, Tuesday and Wednesday. In New Jersey, the Essex County Codey Arena in West Orange will be open to the public as a cooling center. The arena will be open Monday through Friday from 8 a.m. to 7 p.m. and Saturday and Sunday from 8 a.m. to 5 p.m. In Connecticut, cooling centers are open Monday in New Haven, Waterbury, Stamford, Meriden and other cities and towns. The hottest temperatures in nearly a year are also moving into Pennsylvania. In Philadelphia, authorities issued an excessive heat warning for Monday and Tuesday.The city says summer heat programs have been activated, including home visits by field teams and operation of the Philadelphia Corporation for Aging's "Heatline." In Washington, D.C., a hyperthermia alert was issued Monday as highs the rest of the week will climb into the upper 90s and the heat index will be above 100 degrees. The weather service says heat indices are expected to exceed 100 degrees each afternoon Tuesday through Friday.